Rod Hardman VE3RHF gave an excellent presentation on 1Password, a comprehensive password manager for Mac OS X, iOS, Windows and Android. Based on Rod’s demo it seems very easy to use. Another successful milestone int the history of the Oakville Amateur Radio Club. 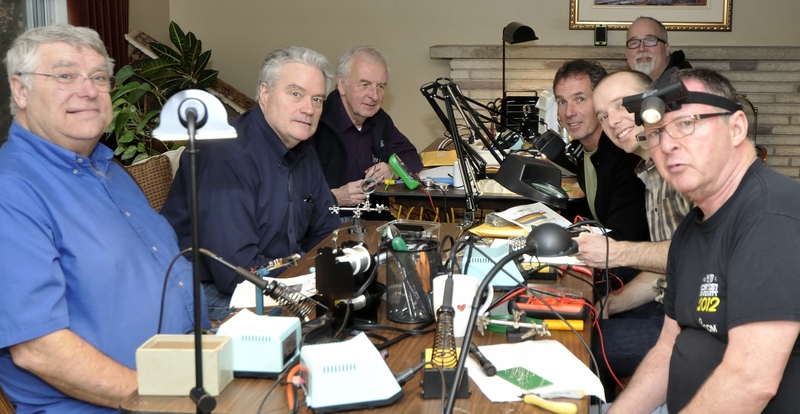 The much-anticipated build day saw four members building (two didn’t make it) and two expert coaches meeting at Peter, VE3HG’s QTH at 9 am after the normal 6:30am Saturday breakfast gathering at Cora’s restaurant in Oakville, Ontario. 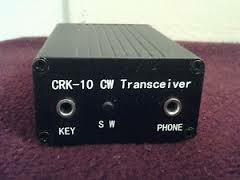 The kit we had chosen was a CRK-10A, a xtall-controlled (7030) three-watt transceiver that will easily fit in a shirt pocket. With no controls but includes an built-in CW keyer with one set memory (CQ and your call), the rig is minimal in appearance but big rig in performance. I’ve (Peter) got one pre-built which we used for a building model and I’ve worked guys all across North America on a 40-meter dipole. More important than the rig was the team-building aspect of the project. It’s a lot of fun to get together with a bunch of members for a day. We ended at 3 pm with one rig working and the other rigs with half an hour or so of work still to go. Listen for us VE3s and VA3s on 7030. Much thanks to Denny VE3OKD and Jim, VE3AJ for their excellent coaching skills. We all learned a lot about kit building. The Oakville Amateur Radio Club’s sponsored ARES (Amateur Radio Emergency Service) group was represented this Saturday by club immediate past president and former RAC director Rod, VE3RHF and myself current president and former RAC VP of PR Peter, VE3HG. Oakville ARES is part of the Greater Toronto Ares which is lead by Section Emergency Coordinator, Rick Harrison, VA3NV. Local ARES emergency coordinators at the club level report to Rick. Under Rick are a bunch of District Emergency Coordinators and to the best of my knowledge the DECs for the GTA North, GTA East and GTA West remain vacant positions. This is of course not a good sign and suggests some underlying issues within the GTA which need to be addressed by the RAC Section Manager. Unfortunately, the last SM quit and Allan Boyd, VE3AJB, who lives in Little Current has been temporarily tasked with being the SM for the GTA despite the physical distance involved. We wish Allan all the best and Oakville will do all it can to support him in building the GTA ARES organization. Here in the GTA (under SEC Rick’s direction) we have an EC for Central, East and West Toronto; one for North and West Toronto, North York; Scarborough; York Region; no one in Etobicoke or Durham Region; a representative is in place in Brampton and Caledon; Burlington; Georgetown; Milton and now Oakville (We used to be Oakville-Milton but the formation of the SHARES group in Milton necessitated the revitalization of the Oakville ARES group which has taken place). To say ARES is in tough shape in the GTA is pretty obvious but where there are willing volunteers (like Oakville) there’s life in the old organization yet. In fact here in Halton Region we have another coordinating body called HRECT – the Halton Region Emergency Communications Team. How HRECT fits into RAC’s ARES structure isn’t clear as it doesn’t show up in any of the RAC organizational charts. Also I can’t remember if any representatives from Oakville ARES has ever attended or been invited to HRECT meetings. Not saying it hasn’t happened just can’t remember it. In the Halton Community Services Database the Burlington, Halton, Oakville Amateur Radio Clubs are listed as is Oakville REACT (which lists Rick Harrison as president) and something called T.B. Radio Communications out of Burlington. Having a regional coordinating body for Halton is probably a pretty good idea as the governmental structure in Ontario has town, city and regional governments. If something was to happen in Halton Region of sufficient size to activate the regional emergency plan, it would only make sense that there be only one regional contact when it comes to Amateur Radio and ARES involvement. Having said that, the fact that HRECT isn’t listed on the provincial ARES page on the RAC site is a concern. A couple of things Rick pointed out to Rod and myself was our EC needs to be a RAC member (although ARES members do not need to belong to RAC and there is some thought out there that RAC is trying to divorce itself from ARES which may or may not happen) and this is something we committed to Rick we’d fix. We also haven’t been as committed to submitting our monthly reports (there’s always paperwork) and we again committed to fixing the reporting issue. On a positive note, Rick said RAC officials had found some of the documentation in regards to ARES members completing the RAC Emergency Coordinator’s Certification Examination. A whole bunch of us completed the exam last March and we haven’t heard a thing since. Well now Rick tells us that some of the exams have been found and since most of us sent in the exams by email we can just resubmit and now somebody will look at them now. Amateur Radio has always attracted a diverse and very independent-minded group of individuals and ARES is no different. Working together in teams is a challenge for some of our members and always has been. Being part of an organized group of volunteers is an accomplishment that not all can access easily. But we continue to try. The Oakville ARES group, part of and sponsored by the Oakville Amateur Radio Club, has a long and proud history of serving the citizens of the Town of Oakville which we intend to continue. Despite the sub-zero temperatures the members of the Oakville Amateur Radio Club were treated to a red hot presentation on Contesting by our own world-class contester Dennis, VE3JAQ. Dennis has won his category in some of the big international contests and trust me, as a long-time contester myself, Dennis taught me a thing or two about improving my contesting abilities. After Dennis’s presentation I offered a quick overview of contesting quality software and hardware. As members of the Oakville Amateur Radio Club know all so well, Amateur Radio works when all else has failed. Time and time again in municipalities around the world it’s been Amateur Radio that often provided critical local, regional even national communications services in the face of overwhelming disasters. Ham Radio operators have the unique ability to deploy from within affected disaster areas setting up communications links independent of power and infrastructure. The Canadian Red Cross Society recognized this and signed a memorandum of understanding with our national organization that calls upon Amateur Radio Emergency Service groups to send volunteers equipped with their radio equipment to provide communications services to the Society in times of need. Too often we feel that it can’t happen here. But that’s not true. It does happen here and when it does so often it’s Amateur Radio operators like those of us in the Oakville Amateur Radio Emergency Service (which is supported and sponsored by the Oakville Amateur Radio Club) who find themselves providing much needed communications. We grow so used to communicating via our cellphones and computers using social media that when the power fails we’re gobsmacked to discover we’re unable to do anything especially something so simple as just calling for help. Normally power outages, especially in southern Ontario, are usually momentary to at most a few days inconvenience but a massive snowstorm like the one that hit Buffalo late last year could isolate parts of our communities for days causing particular hardship to seniors and shut-ins. In these situations, working with the Canadian Red Cross Society and municipal officials, it’s often Amateur Radio with our ability to communicate across town or across the country with little or no forewarning or existing infrastructure that comes to the rescue. And now with our exciting new venture into creating a wireless MESH network on Amateur Radio frequencies we are very soon going to be able to provide this wireless, high-speed private Internet-type service that’s a resilient and robust data-based communications tool to our local municipal authorities in time of need. A few of us in Amateur Radio (and just about nobody outside of our hobby) are starting to realize the power of this new communications tool. Essentially someday very soon, we will be able to provide portable self-powered computer terminals to police, fire and ambulance services as well as municipal authorities and our regional hospital that will work independently of power and again, infrastructure. Why would they need such a service? 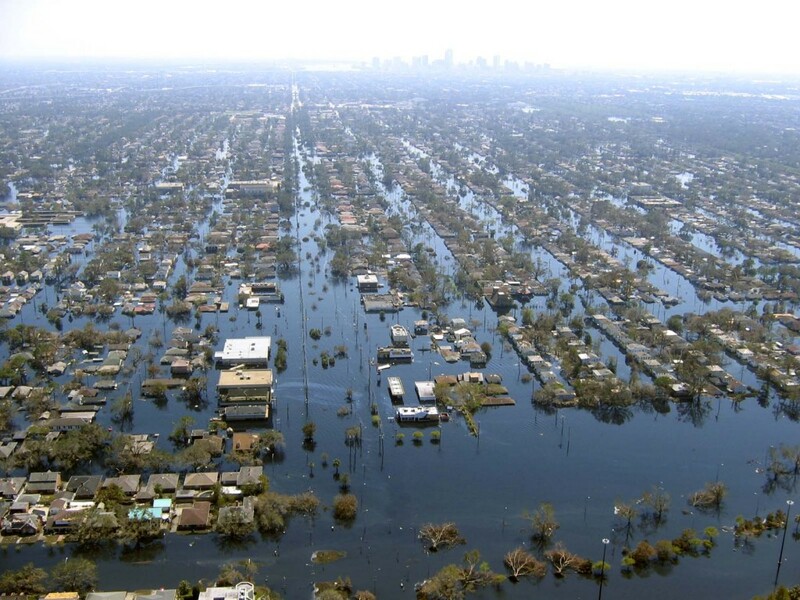 If the power fails like it did when New Orleans was hit by Katrina, backup power generators will run for 10-12 hours before needing refilling. But once the backup fuel is used up there’s no more as gas stations need power to run their pumps. Cell systems are not designed to work under the assault of hundreds of thousands of calls and their infrastructure collapses just before their backup batteries fail. Now we’re cold, in the dark and without an ability to communicate. Sure we can call in the army but they’re going to take a couple of days to take over. Can’t happen in Ontario, you say? 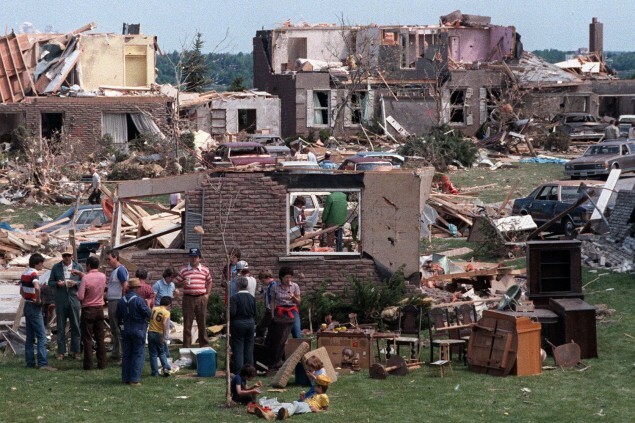 It happened here when the tornado that struck Barrie in 1985 first ripped through Grand Valley. Nobody knew until a Ham Radio operator driving through the area alerted authorities that there was heavy damage in the valley. We won’t even talk about nuclear power in Pickering but maybe we should. Nobody knows what would happen if we had to evacuate several million people. 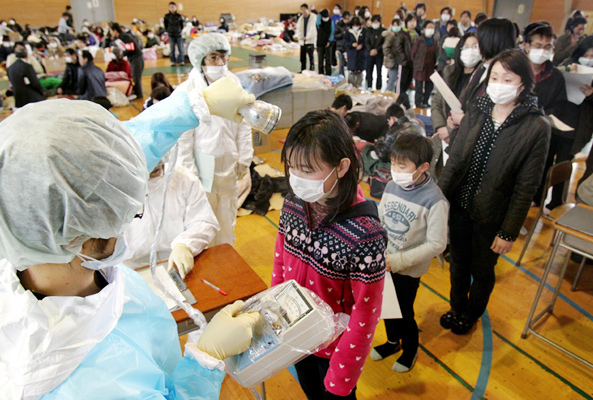 The people living near Chernobyl and Fukushima might have something to say to us as they aren’t going back home again…ever. Ham Radio is like a free insurance policy. It doesn’t cost anything to add it to the community plan and for years you might not even think about it. And then comes the day which none of us can imagine and suddenly Amateur Radio becomes invaluable. Thanks again to Gary Carr and the municipal mayors for remembering us because over the years (and the decades) ARES groups in municipalities just like ours formed groups, did some self-training and stood ready to perform when all else fails.